Super Single Size Satin waterbed sheets are for lovers! Our satin sheets are proudly sewn in the USA for us, from 100 percent quality polyester. These sheets have a great fit, a high sheen and a wonderful silky feel. Satin sheets should always have a quilted mattress pad underneath. Available in seven colors. Our satin waterbed sheets are sewn together at the foot. We do this to help keep the top sheet in place. Satin is so smooth that top sheets, especially on a waterbed, tend to migrate unless they are sewn to the bottom sheet. Our satin waterbed sheets are lightweight, strong and resistant to creasing, shrinking, stretching, mildew and abrasion. It is readily washable and is not damaged by sunlight or weather and is resistant to moths and mildew. Our satin waterbed sheets come with a top sheet and a pocketed bottom sheet sewn together. Two pillowcases are provided with the king and queen size and one pillowcase comes with the super-single size. Our optional satin comforters are great! They are stuffed with 100% soft polyester fiber for an expensive look. They are also washable. 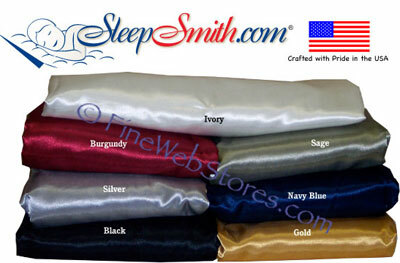 Complete 100% satin sheet set available as a six pocket or attached design and matching 1-2 pillowcases. Proudly sewn in the USA! Available in various colors.